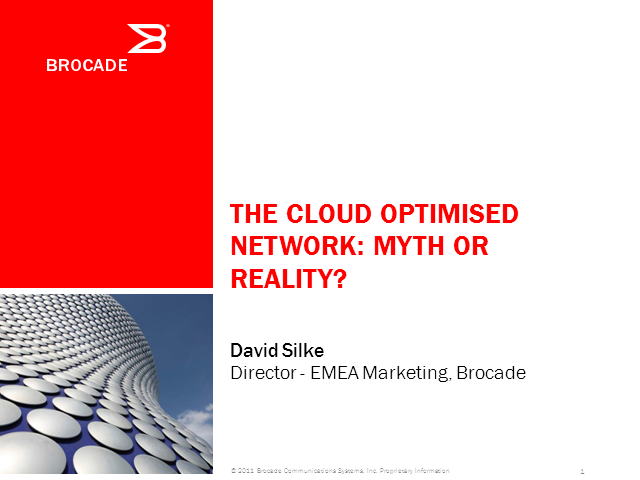 The Cloud-Optimised Network: Myth or Reality? With data volumes exploding (predictions state more than 35 Zetabytes of digital data will be generated by 2020), the way we manage and consume information is evolving. Traditional IT environments of yesteryear can no longer scale with demand, and in tough economic times, businesses cannot afford to expand on-premise assets at the pace required. What is the answer? Many businesses are looking to the cloud. Great idea, but is the network ready for this? Can the network deliver the performance and reliability needed to make the cloud effective? If only there was a cloud-optimised network... this session will explore whether there is such a beast. Title: The Cloud-Optimised Network: Myth or Reality?